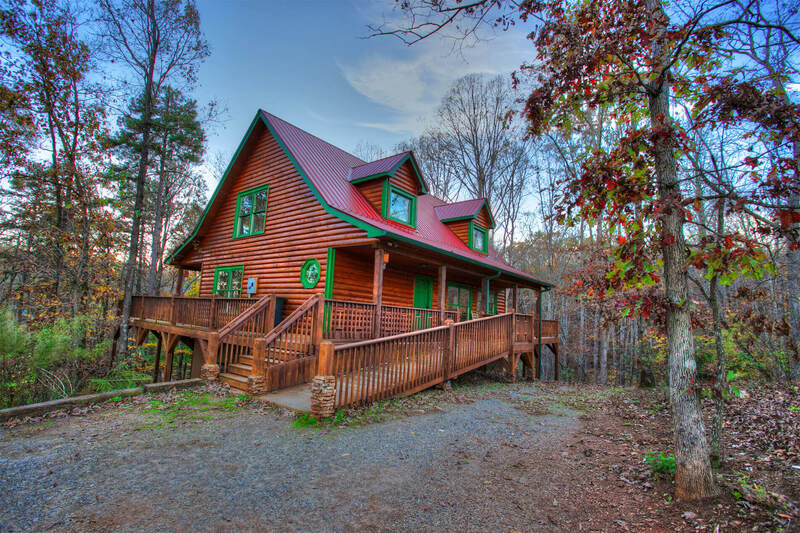 This beautiful cabin home for up to 8 guests has tons of extras, including a master suite with a custom king-size bed, a Jacuzzi tub, and a two-person shower with double sinks. You'll love the stacked stone features and granite countertops throughout. Relax in the rocking chairs, hot tub, and recreation room with flat screen TV, DVD player, pool table, log bunk beds and many games and jigsaw puzzles. This secluded home is in a quiet area with a private fire pit to sit around for relaxation and roasting marshmallows. Enjoy the outdoor seating on three decks and the wrap around porch. The main living room has a unique two-story stacked stone corner fireplace with a large flat screen TV and DVD player. Other extras throughout the home include satellite TV, wireless internet, and hardwood floors. The entrance ramp is wheelchair accessible. A log home community playground is within walking distance. All ages enjoy staying in this cabin and visiting the area, and it's a short ride to the picturesque Bavarian village of Helen for shops, restaurants, music, horse-carriage rides, mini-golf, walking, tubing, water parks, fishing, and homemade fudge! Medium-sized families that still want a spa-like experience for Mom and Dad during their secluded cabin vacation. This cabin is wheelchair accessible. The Whispering Pines rental fee includes 6 guests. Booking 7 guests will incur an additional $10/night fee. Choosing 8 guests will result in an additional $20/night fee. I don't often have the occasion to recommend a cabin but I'd give a thumbs up to Whispering Pines if somebody needed one in this size range. Lovely cabin and setting. So relaxing. We wanted to stay a week and will be aback for a longer stay. The cabin met all of our needs. The first being that it was handicapped accessible. Nice beds and lovely porches and a fireplace. Service and cabin were exceptional. Your cabin is good for family vacations. It has space for everyone to spread out and enjoy themselves. Cabin was very clean and welcoming, easy check in and check out. Cabin was in a great location and included everything you need for peace and solitude. Great for reconnecting with nature as well as yourself.